Create the perfect setting for any outdoor function. 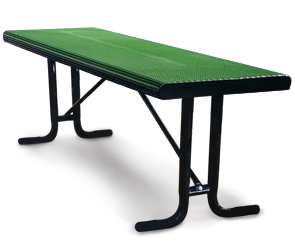 Features a long lasting, non-corrosive table top with rolled edges and a durable powder-coated finish on the legs. Ideal for corporate events, picnics, parties or for use as a prop table. Tops and seats are coated with a slightly textured Polyethylene finish in the color options as shown. For permanent placement, optional accessories include surface or in-ground mounting clamps that attach to existing tables. Table does not come with seats.